This has become a series of posts. The first two posts are here and here. Thanks to Cheryl, Amy, Karen, and France for our discussion on this issue on Tuesday. In my last post, I wrote about how we must act like caterpillars to consume as much food(learning) as we can before we are ready to metamorphose into butterflies. The discussion generally leads to questions like, "When do teachers have time to read and learn at a rate that will lead to this metamorphosis?" It got me thinking about caterpillars again. 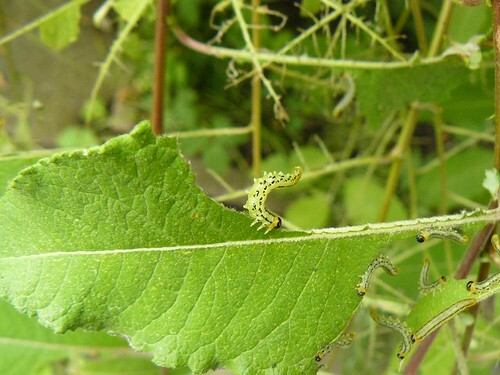 Have you ever watched caterpillars eat? They take such small bites that it is difficult to see that they have actually eaten anything. But over time, they can consume many leaves that larger than they are. With the tools available to us today, we can be constantly collecting information in small bites throughout the day. We can't wait around for those staff development days when we have hours to dedicate to learning. We need to be efficient consumers of information. In addition, our students need experience with this as well. Kids are more adept at multitasking, allowing them to read in small amounts and process in between opportunities to read. With tools like RSS aggregators, we can have access to information quickly and easily. We don't need to waste time going to search for the information. Let it come to you. Set aside 10-15 blocks a couple times a day and commit to reading relevant articles or trying one new idea, or writing one new lesson that infuses technology and 21st century skills. Mark your calendar for one month from today. At the end of the month, look back on how much you have learned and adapted. You will be amazed at your metamorphosis! Good luck and let me know how your metamorphosis is going!! Don’t Be the Bat Lady!